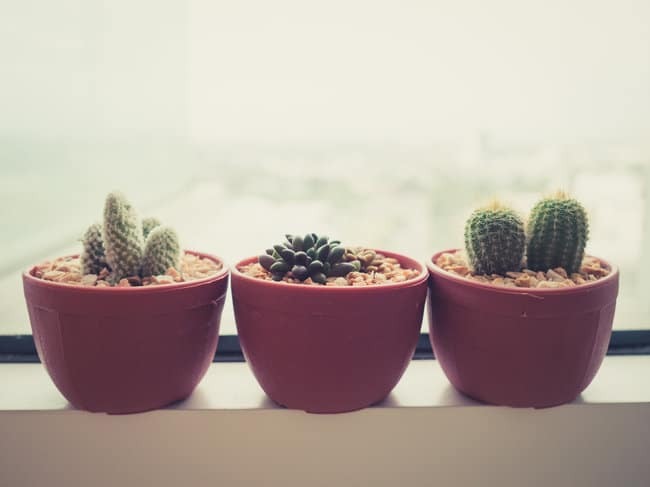 Blog What's The Difference Between Succulents And Cacti? What’s The Difference Between Succulents And Cacti? When you think about succulents and cacti, I’m sure most people assume they are two separate but closely related groups of plants. However, its a bit more complicated than that. Succulents are a loose grouping of plants which have special adaptations to allow them to store water within their stems, leaves and roots. They are not a distinct plant family. There are succulent plants within at least 60 different plant families. This makes succulents a very diverse group of loosely connected plants. Cacti, on the other hand, are a defined family of plants within the scientific taxonomy and classification of plants. All cacti are succulents, but not all succulents are cacti. Most people assume that cacti are easy to spot, because they’re the ones with the spines. I thought this for years, but it turns out it’s not the case. Many plants other than cacti have spines, both within the succulent group of plants, and some more widely. Also, many cacti have few or absent spines, so can easily be misidentified if you are not looking for the right things. It turns out that there is one fool-proof way to determine if you are looking at a cactus. It all comes down to areoles. These are small, round light or dark colored bumps on the surface of a cactus and is where the spines, hairs and flowers grow from. If a succulent plant has areoles present, it is a cactus. If it does not have areoles, it can’t be a cactus. Interestingly, most cacti have no true branches or leaves. This is an adaptation to prevent water loss in the commonly arid climates which most cacti live in. Areoles are the cactus equivalent of tree branches, and the spines are the leaves. There are, however, some branched cactuses, such as the Saguaro cactus. In this case, the branches grow from the areoles. Lets move on to learn a bit more about succulents. The group of plants that make up the category of succulents spreads across more than 40 plant families, with some if not most plants in those families being succulents. Plant families containing lots of succulent species include the agaves, aloes, cacti, crassulas, echeverias, euphorbias, kalanchoes, mesembs, sedums, and sempervivums. The word “succulent” comes from the Latin word succulentus, which means “full of juice.” Just look at the aloe vera, which is famous for the mucilaginous gel found inside the plant’s thick leaves. But the presence of a sappy substance alone does not confirm that a plant is a succulent. In fact, there is no clear definition for what a succulent plant is. For example, there’s a lot of controversy over whether yuccas belong in this group. 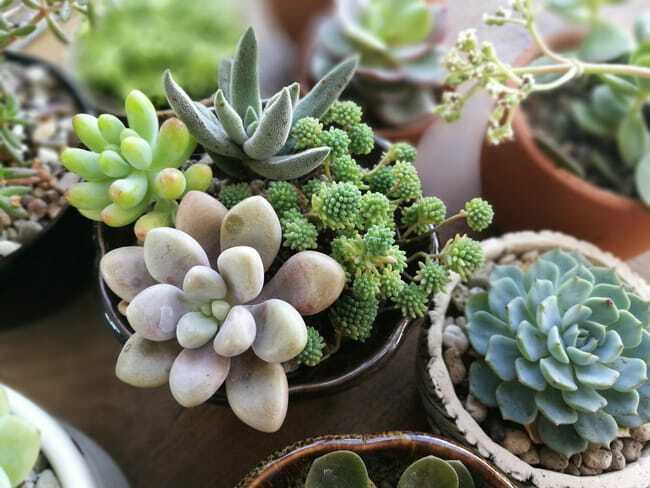 One way plant experts attempt to clarify the issue is to specify that a plant must have fleshy leaves or stems that temporarily store water for use during dry spells to qualify as a succulent. This definition excludes storage organs such as roots, corms, rhizomes, and bulbs. These features store food along with water and help the plant survive adverse conditions that include excessive cold or heat and lack of light, rather than existing solely for the purpose of helping the plant survive dry periods. The reason why a plant stores water is important too. This is reflected in the fact that the common usage of the term “succulent” refers to xerophytic succulents – drought-resistant plants. This is in contrast to halophytic succulents, which are plants that store water so they can survive in salty environments like seashores, swamps, and marshes. Horticulturalists usually also exclude bromeliads, orchids, and palm-like cycads, as the distinctive characteristics of these unique plants simply outshine their succulent characteristics. To learn more about succulent care, read my article all about it here. Large concentrations of thick, glutinous mucilage. Surface features that protect the plant from water loss, such as a waxy coating as well as hairs or spines that break up air flow around the plant and provide some shade. Ribs or grooves that allow the plant to swell with water and then shrink during drought to decrease the surface area exposed to the sun. Compact, columnar, or spherical growth patterns that maximize the proportion of internal tissue as compared to the exposed surface area to minimize water loss. Green stems that conduct photosynthesis. Shallow root system that’s able to take up small amounts of moisture that may occur at the surface of the soil. Crassulacean acid metabolism (CAM), which allows the plant to reduce water loss by only opening its pores at night to take in carbon dioxide needed for photosynthesis. A cactus is a flowering plant belonging to the botanical family Cactaceae, which contains over 1700 known species, almost all of which are succulents. Plants of the cactus family are endemic exclusively to the Americas, with the single exception of mistletoe cacti (Rhipsalis), which also occur naturally in isolated areas of tropical Africa and Asia. Most cactus plants are desert cacti, with the towering saguaro cactus (Carnegiea gigantea) of the Sonora Desert being the most iconic. But there are also jungle cacti, such as the Christmas cactus (schlumbergera), that hardly seem like cacti at all. Cacti share many characteristics with other types of succulents, having certain tendencies that are typical but not unique to cacti. For example, most cacti are stem succulents with leafless, waxy, green-colored stems that store water and carry out photosynthesis. Sometimes the stems look like leaves, as with Christmas cacti and prickly pears (opuntias), where the plant’s multiple stems are made up of flattened segments or pads. 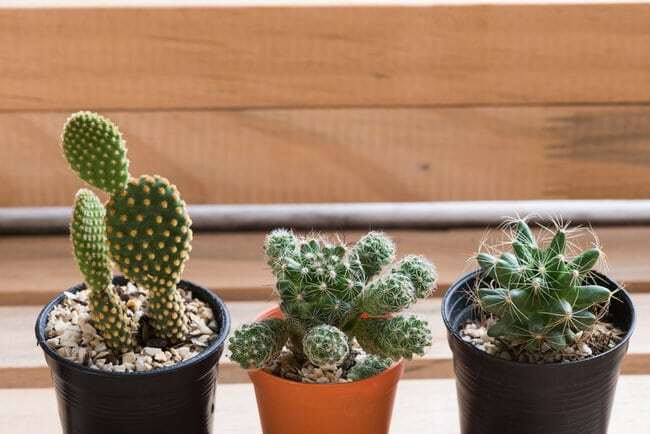 Other succulent water-saving features that are very typical of cacti include ribbed or grooved stems, columnar or spherical growth patterns, shallow root systems, and lots of spines. And all cacti have CAM photosynthesis. 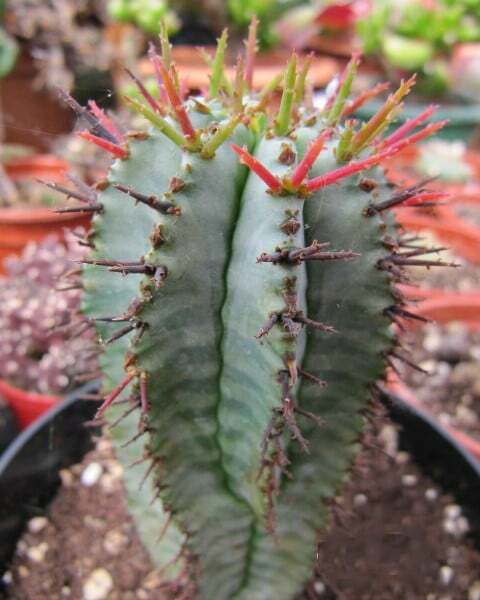 As mentioned previously, the one feature that is unique to cacti, which no other plants have, is a specialized structure at the base of the plant’s spines as well as its branches, leaves, and flowers. These features, called areoles, allow cacti to more effectively produce protective spines, and they commonly have multiple spines sticking out of them. Another way to identify a true cactus is to look for big, bold, colorful flowers that produce fruit. If the flowers of a blooming succulent are small or unimpressive, then it’s probably not a cactus. 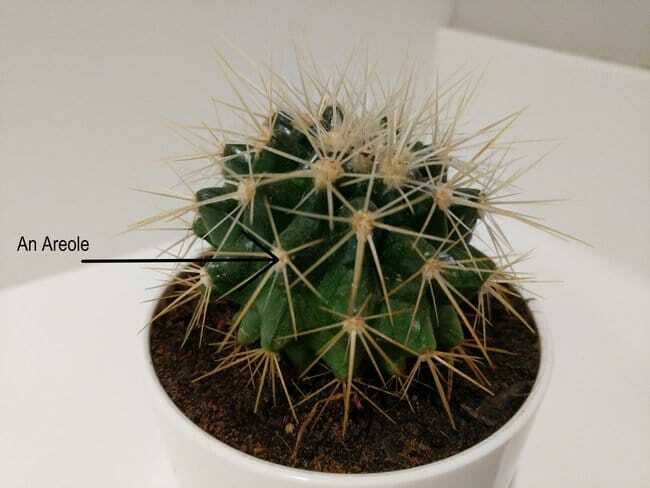 So, if a cactus-like succulent has spiky thorns but they don’t emerge from raised bumps or pads, then you know it’s not a cactus. The main culprits in this cactus mimicry game are succulents in the Euphorbia genus. These plants evolved to fill arid climate niches in Africa that are similar to those in the Americas that gave rise to cacti. The Didiereaceae family of succulents from Africa and Madagascar also has a lot of cactus lookalikes. If you are having trouble identifying your succulent plant, or deciding whether you have a succulent or cactus on your hands, check out the amazing cacti and succulent identification page over at plantsam.com. Since cacti are succulents, you can follow the general guidelines for succulent care, taking note that desert cacti need a lot of bright, direct sunlight – at least five-six hours a day. They’re accustomed to higher temperatures and lower humidity, although they will adjust to most home environments, provided they’re getting enough light. Be sure to allow the growing medium to dry out completely between waterings, and you usually don’t need to water them much at all during their winter dormant period. The jungle cacti are a special case, requiring indirect sunlight, higher humidity, and an evenly moist growing medium throughout the year.